Located in the River Strand Golf and Country Club, this rare find is a golf lover's dream! 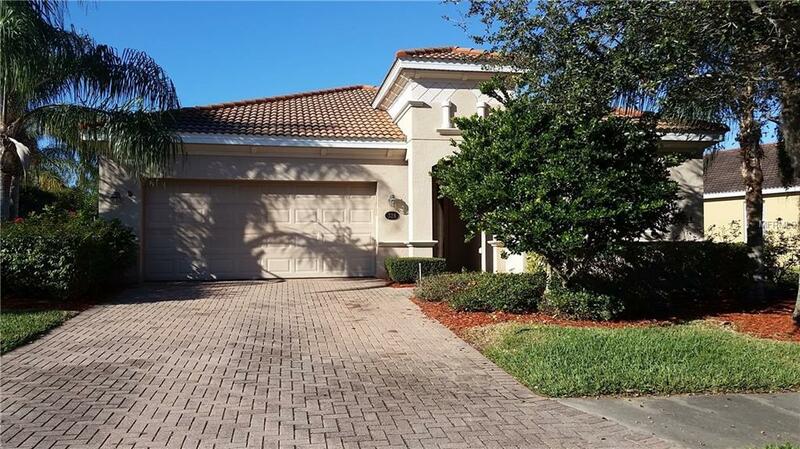 Treat yourself to the Florida lifestyle you have been dreaming of in this 3 bedroom home. The open floor plan makes this 1800 sq ft home feel extra spacious and creates an ideal area for entertaining. Glass doors in the living area allow in plenty of natural light and open on to a large lanai. Your private lanai is the perfect spot to enjoy the year-round warm weather while taking in the tranquil view of a lush tropical preserve. The gourmet kitchen features solid surface countertops, stainless appliances, and a breakfast bar for casual dining. The luxurious master suite offers a relaxing preserve view, dual walk-in closets and master bath with a garden tub, separate shower stall, and his and her sinks. The neutral tile throughout the living areas and carpet in the bedrooms, is sure to match any decor. There is even a separate laundry room with full-size washer and dryer and utility sink for added convenience. Pets considered.River Strand Golf and Country Club is the perfect golf and luxury-living community in the Greater Sarasota area. Residents are treated to Unlimited golf privileges on an Arthur Hills designed course (just pay cart fees), lighted tennis courts, resort style swimming pool, restaurants and a well-equipped fitness center. A one-time membership transfer fee is required. Lawn care is included, giving you even more time to take advantage of the fantastic amenities.